8th grader Ian Krueger taps the timer, picks up his Redi Cube, ande starts frantically twisting the corners. His eyes dance around the puzzle, analyzing the color patterns and recognizing opportunities to use memorized algorithms. 7.12 seconds later, Krueger looks up in amazement at his time, the second fastest time in the world and the world record average solve time. The Redi Cube is a variant of the Rubik’s cube where the corners are turned instead of the center. Because of this different conceptual design, solving the Redi cube can be much different from solving the Rubik’s cube. However, similar to the Rubik’s cube, people must memorize plans, patterns, and algorithms to solve it. But, being able to solve it quickly is a completely different story; that takes hours of practice and dedication. To be able to compete at an elite level, Krueger practices every day, studying the patterns and algorithms necessary to solve the puzzle while putting them into use by solving the cube over and over. “When I was preparing for the competition, I practiced probably an hour a day,” Krueger said. Just like in any sport, improving solve times derives from cold, hard practice. However, unlike sports, there isn’t a gene for cubing. Natural talent has very little impact on performance. The fastest cubers are simply the ones who practice the most. Krueger’s world record is a testament to hard work and his dedication to the craft. In October 2017, Krueger participated in a cubing competition sponsored by MoYu, the company that invented the Redi Cube. The event was intended to boost the popularity of the Redi Cube by inviting local cubing clubs to compete using the cube. Krueger’s club, the 3rd Coast Cubing Club, was invited. The competition was held at Hope College’s Schaap Science Center. The room was bustling with activity. There were about 15 other competitors and many more spectators. Volunteers laid out mats with timers at each table, allowing competitors to tap the timer to start the clock and tap it to stop when they finished solving the cube. Knowing he had the opportunity to clinch a world record, Krueger was nervous, but excited to perform. He wasn’t going to let his hard work go to waste. “My first solve was an 8.3, a great start, totally unexpected because I was so nervous. Then my second, an 8.7, helped boost my confidence. My 3rd solve, an 8.9, was my worst of the 5 solves. My last two, a 7.21, and a 7.12 were the cherry on top,” Krueger said. At the end of it all, Krueger ended up with the world record average solve time of 8.08 seconds and the second fastest single solve time of 7.12 seconds, making him World Champion of the Redi Cube competition. “I was so hyped because I knew I could break the World Record, but I didn’t realize I could break it by more than 1.5 seconds. I was so excited, and couldn’t believe it,” Krueger said. But for Krueger, cubing isn’t just about breaking world records and having fast times, he also enjoys the cubing community and the many experiences he’s been able to share with his friends. “I enjoy the cubing community and how easy it is to get into cubing, everyone is so nice and inviting…Also, it allows me to make friends and try new things,” Krueger said. For his future in cubing, Krueger hopes he can make a career out of his talent. “I hope to get sponsored and go to competitions all around the world. I love to travel and see things, so that would be a lot of fun,” Krueger said. Cubing has placed Krueger in the record books forever. What started as an extracurricular activity has blossomed into a passion that may pave the way for his future. 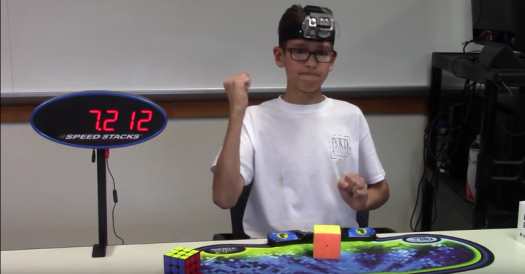 Krueger’s early success in cubing shows the magnitude of his potential. With his hard work and diligence, Krueger’s future looks full of promise.